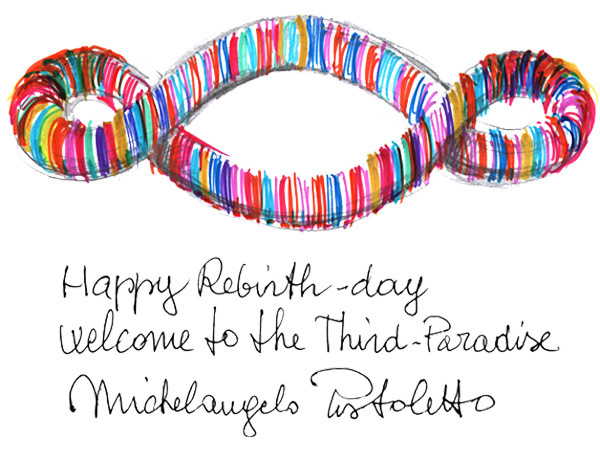 On December 21, 2012, we met in the streets and squares all over the world, and on the Web, to take part in the great inaugural celebration of the Third Paradise. We had the extraordinary opportunity to joyfully and eagerly create our future destiny together: we have participated, with whatever form of expression (performance, music, sound, installations, images…) in creating a great common artwork. Rebirth-day is an annual event, a celebration that is renewed every year: let's work all together in the new edition of Rebirth-day, on December 21, 2013. The exhibition of Michelangelo Pistoletto is possible also thanks to the support of Galleria Continua.